Krystal and I were standing there, minding our own business, at a Bloomington bridal show a bit more than a year ago looking for wedding couples. You know — the usual, things photographers do at bridal shows. Hand out pens. Show off our gorgeous canvas wraps and our wonderful wedding albums. Talking with folks. And, suddenly this familiar blonde appears with this young guy in tow. And tells us we need to shoot her wedding next year. I did my usual confused look — and realized this young lady was Ashley. Ashley, as in a high school senior from not so many years ago. Alison’s daughter who had been part of many a family photos with Mike. Ashley — Alison and Micheal’s daughter. Ashley, one of the bridesmaids in her mom’s wedding. The young guy in tow, Bobby. Her fiancé. Her mom’s wedding was not that many years ago, back in 2009. Alison made a gorgeous bride with her groom, Michael and I had not doubt Ashley would do the same. I’ve included one of their wedding photos with the other neat photos on this blog. Needless to say, we were thrilled to speak to her and Bobby. Even more thrilled to book them for their wedding day, which took place back in September. 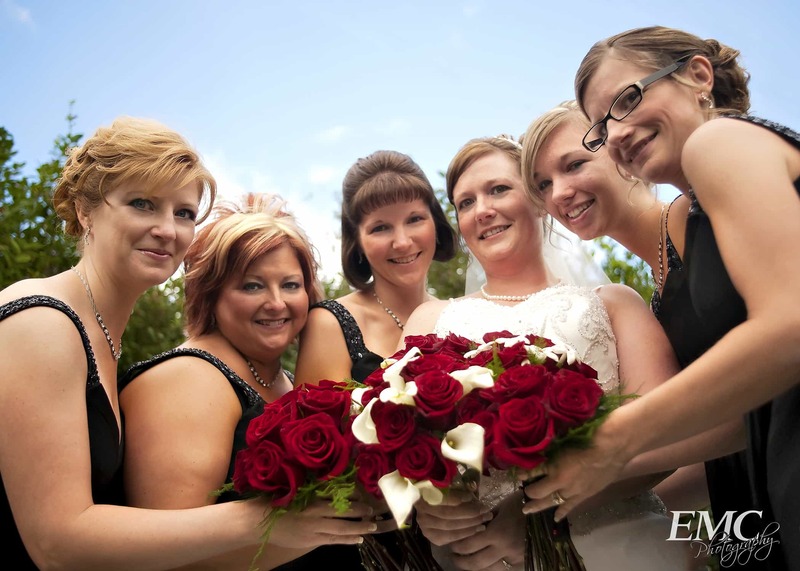 Alison along with her bridesmaids on her wedding day, including Ashley, a few years ago. The wedding took place at St. Patrick’s of Merna with a reception following at Eastland Suites. The bride, gorgeous, of course. She chose the perfect gown — from Country Lace Bridal (the Allure collection). The groom, well, a bit nervous but ready to go in his tux from the Men’s Wearhouse. He did have his groomsmen to keep him entertained as they waited for the ceremony to start. They did one thing that I had never had a bride and groom do before — and found to be neat. Many brides and grooms write their own vows these days for their wedding. Something not possible when getting married at a Catholic church. Instead they wrote letters for each other and then exchanged them during the first look. Loved both of them on this part, making this even more emotional first look. After the ceremony we headed to Miller Park for some fun photos. And they were able to visit with their favorite puppy, Reggie! Their doggie visited to make sure he was not left out of the photos from the day. Ashley and her favorite dog (well, her only dog, but still her favorite) exchange a kiss during a visit to the park after the wedding ceremony. Cuddles and Cuteness ensued. Reggie had fun! The bridal party added to this, of course, as the bridesmaids discovered their dress could be quite customizable. And then off to the reception — with a fabulous meal — at Eastland Suites. Of course, the day’s embarrassing moments were not complete yet. The DJ, Faith Rinker from Glass Slipper Entertainment, brought the Hat Game to the floor for them. And provided a bit of fun in answering a few personal questions in front of their family and friends. Bridesmaid Ashley checks Ashley, the bride’s, make-up. Ashley’s mom Alison adjusts her veil. Ashley and her bridesmaids do a few poses before the ceremony. Ashley poses with her bouquet at St. Patrick’s of Merna in Bloomington before her wedding. Groomsmen keep Bobby distracted before the ceremony. Ashley and Bobby read letters they wrote to each other for their wedding day. Bobby and his groomsmen await the bride after making their way down the aisle at St. Patrick’s of Merna. Bobby gazes into his bride’s eyes during the wedding ceremony. Ashley and Bobby kiss as bridal party cheers them on at Miller Park in Bloomington. 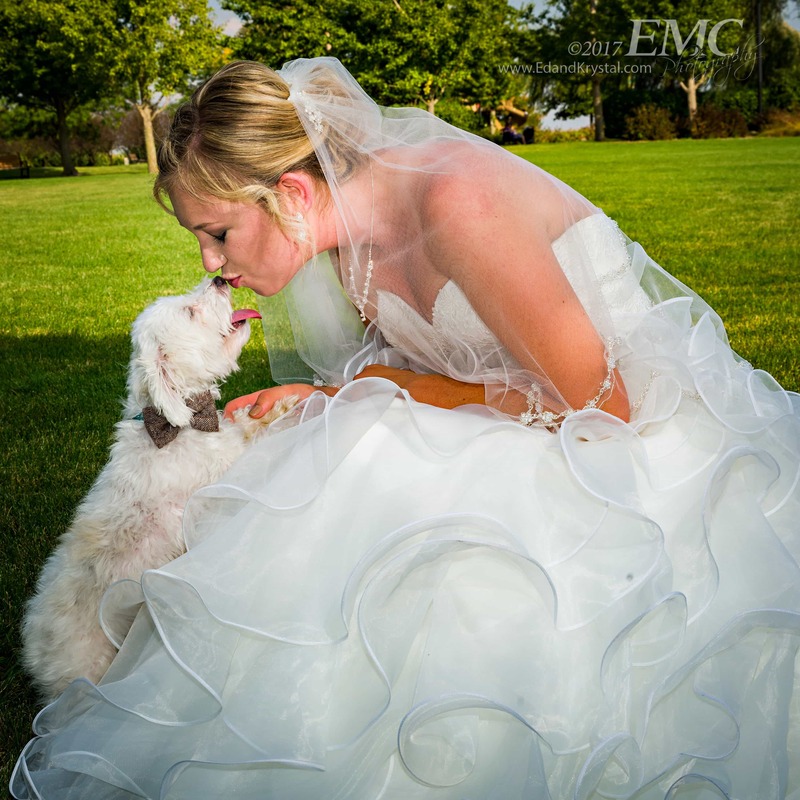 Ashley’s wedding gown train is the perfect spot for Bobby to play with their puppy. Give them a few minutes to play and bridesmaids prove their dresses can be a lot of fun. Well, at least one of the bridesmaids wants to watch the bride during her first dance! Okay, maybe the others are taking a photo or two. Time for some crazy dancing! « Fall colors make for a spectacular wedding!